It is not the first time Kerala fishermen have faced a turbulent sea, but the sheer ferocity of Cyclone Ockhi has shaken them badly. Trapped in violent waters, with no food or water, desperate eyes searching for help in the middle of a turbulent sea -- sum up the helplessness of the fishermen. Though many fishermen were brought ashore safely and admitted to hospitals, many are yet to recover from the shock of wrestling the lashing waves and seeing death face-to-face. IMAGE: Stranded fisherman being brought to Kerala coast by Indain Navy personnel, in Kochi on Saturday. “It was the first time we were experiencing such huge waves and a rough sea. 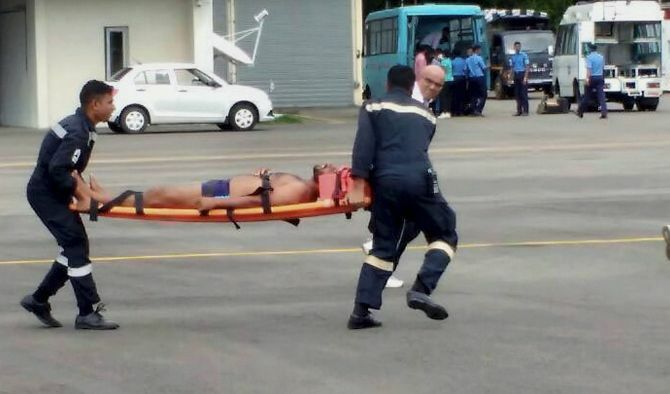 Luckily, the rescue boat came back and saved us,” Stephan, who is recuperating at the Government Medical College Hospital in Thiruvanthapuram, said. Most of the rescued fishermen had bruises all over their bodies and were seen shivering and begging for hot water and food when brought ashore. Titus, another fisherman hailing from Neendakara in Kollam district, said he had never seen such a violent sea even in movies. He said strong winds virtually threw them in the sea and that they somehow managed to hold on to the boat, till the rescue team arrived. 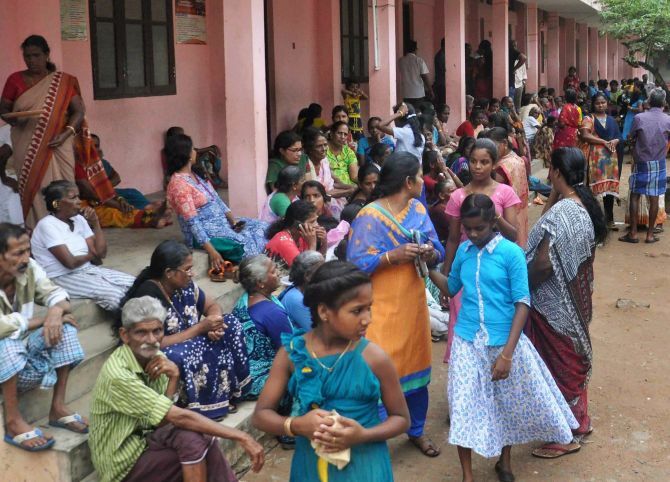 IMAGE: People gathered at a relief camp following the impact of Ockhi, in Kochi on Saturday. His fellow fisherman Kennedy said their boat drifted aimlessly for around 100 km in the gusty winds. Meanwhile, anxious families of fishermen, who are yet to return, expressed their anguish and protested by holding roadblocks in various places in Thiruvanthapuram. The weeping women said they were waiting with prayers and tears for their beloved ones to return. As many as 531 fishermen, stranded in the choppy waters off the Kerala and the Lakshadweep coasts due to the cyclone, have been rescued, Kerala Chief Minister Pinarayi Vijayan said on Saturday. So far 393 people from Kerala have been rescued, Vijayan said, as the state government announced a compensation of Rs 10 lakh to the family of those who died in the storm. Of the rescued, 132 fishermen were from the state capital Thiruvananthapuram, 66 from Kozhikode, 55 from Kollam, 40 from Thrissur, and 100 from Kanyakumari, Vijayan told reporters. Besides, 138 fishermen have been rescued from the Lakshadweep islands, he said. Vijayan said the Rs 10-lakh compensation would be in addition to the financial assistance of Rs four lakh being given by the fisheries department. Assistance will also be provided to those who had lost their boat and equipment, he added. 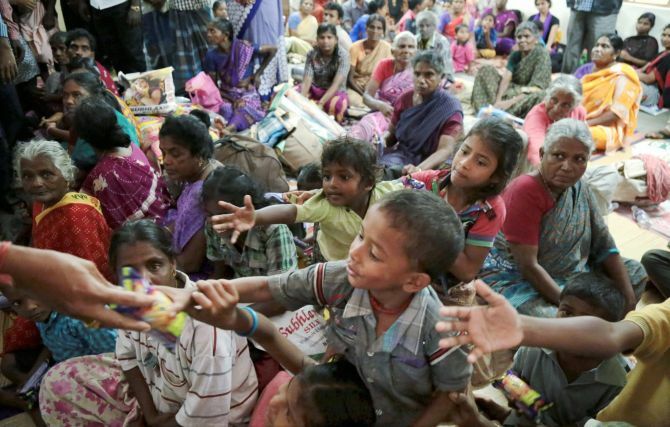 In Lakshadweep, 31 relief camps have been opened in the 10 inhabited islands. So far, 1,047 people have been evacuated to the relief camps, official sources said. 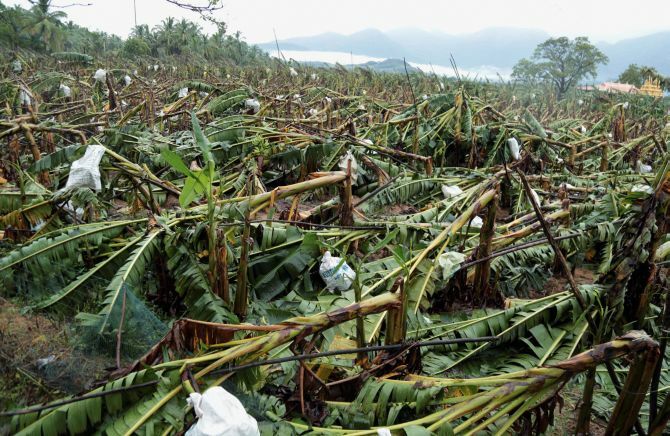 IMAGE: Banana plantation damaged due to heavy rainfall caused by the cyclone. No casualties have been reported, with the worst-affected islands being Minicoy and Kalpeni. Seven people have lost their lives in Kerala in rain-related incidents over the past two days, official sources said. The state government has opened 29 relief camps in various places. Several houses suffered damage, coconut trees got uprooted and communication lines were disrupted as rains accompanied by strong winds lashed the Lakshadweep islands under the influence of Cyclone Ockhi. Five fishing boats were damaged early on Saturday at Kalpeni Island as water level rose due to heavy rains, sources said. The 'very severe' cyclonic storm Ockhi -- which in Bengali means 'eye' -- over Lakshadweep is likely to intensify further in the next 24 hours. It is likely to continue to move west-northwestwards across Lakshadweep islands during the next 24 hours and then recurve north eastwards during the subsequent 48 hours, according to the latest Met department bulletin. 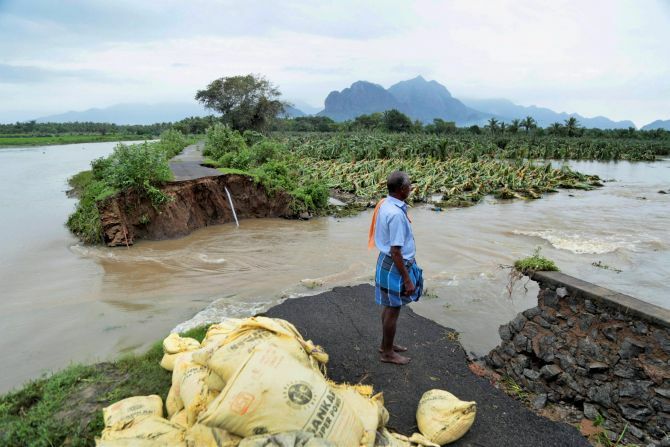 IMAGE: A man watches a road that has been cut off due to floods following the heavy rainfall caused by the cyclone which left heavy damage in the Kanyakumari district. Minicoy Island in Lakshadweep received 14cm of rains in the last 24 hours ending at 8.30 on Saturday morning, Met department sources said. Coconut trees have been uprooted in various places and houses damaged in eastern Kalpeni and Minicoy, official sources said, adding the extent of the damage was being assessed. The breakwater jetty, the embarkation and disembarkation point to Kalpeni island, has suffered severe damage. Gale winds with speed reaching 120-130kmph gusting to 145kmph is very likely over Lakshadweep in the next 24 hours and gradually decrease thereafter, the met bulletin said. Giant waves were expected along the Kerala coast, official sources said. The Tamil Nadu government on Saturday requested the Centre to deploy helicopters of the Indian Navy and Coast Guard for the search and rescue of missing fishermen, mostly from Kanyakumari. Chief Minister Edappadi K Palaniswami made the request as he discussed the situation with Union Home Minister Rajnath Singh. Singh had called up the chief minister and sought details on the damage caused by the the cyclone, an official release said. IMAGE: Stranded fisherman being brought to Kerala coast by Indain Navy personnel. Palaniswami told Singh that Kanyakumari and Tirunelveli had suffered the worst damage, and detailed the relief work being carried out in ‘full swing’ there, it said. Further, most of the fishermen who had ventured out to sea were rescued by the state fisheries department and the Coast Guard, he said. "The chief minister requested (Singh) that the Coast Guard and Navy should continue assisting the state government in swiftly rescuing the fishermen who have not returned so far, and that helicopters of Coast Guard and Navy should be deployed for this purpose," the release said. 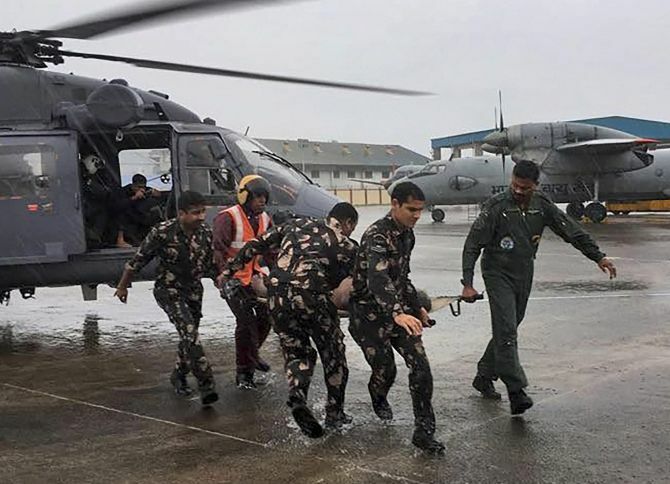 The Indian Navy and the Coast Guard continued search for missing fishermen using ships, dornier aircraft and helicopters in the ‘rough sea’ off Kerala and Lakshadweep. While INS Nireekshak, INS Jamuna and INS Sagardhwani are continuing search and rescue operations in their designated areas along the coast off Vizhinjam in Thiruvananthapuram and Kollam, two ships INS Shardul and INS Sharda are heading towards Lakshadweep, a defence spokesman said. Fishermen, tourists and coastal population have been advised not to venture into the sea for the next 48 hours as the sea conditions are likely to be non-conducive due to the effect of Ockhi. A Coast Guard advisory in Mangaluru said the status of weather and sea conditions should be checked on television, radio, newspapers and smart phone applications before venturing out into the sea. The merchant ships should also be alert and avoid the path of Cyclone Ockhi, it said.